We had a jam-packed weekend, with my brother and his lovely wife visiting us. We didn't do much else except spend some quality time together and rub my sister in-law's adorable baby belly (they are expecting their first, a little boy, in July). But, I did get to cook a fabulous meal for them (I'm nothing if not modest) and I thought I'd share it here. 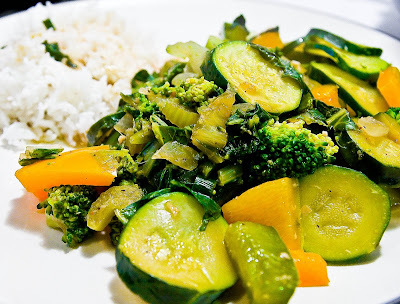 This is such an easy and versatile stir-fry - you can really add any number of veggies to it. In the picture you can see that I added bell peppers, celery, zucchini and broccoli, but I've also substituted mushrooms, cubed tofu, carrots - you name it. And for those of the meat-eating variety, I'm sure you can throw chicken or beef strips in as well (I imagine that if you're using meat you might want to marinade it in the seasonings for a couple of hours or overnight first). I usually serve my stir-fries with rice, but not always white rice. We always have wild and brown rice on hand which also compliment this dish nicely, or you could omit the rice altogether and just make extra stir-fry if you're so inclined. Really anything goes with this! - Heat a large wok or skillet to medium-high (I don't use oil, I just keep a cup of water on hand and add a tiny bit at a time when things start sticking. Of course if you'd rather cook with oil you can add it to the skillet at the beginning). - Add garlic, ginger, bok choy and veggies. Stir-fry over medium-high heat until bok choy is wilted, about 3 minutes. - Add tofu cubes (if you're adding them) and brown for 1 minute. - Stir in soy sauce, hoisin sauce, scallions and pepper. Heat through, about 1 minute. - Serve over rice (I usually make between 1 and 1 1/2 cups, depending on how ravenous the brood is).